"Lux: Action in the North Atlantic"
The film based on William Riley Burnett's novel Little Caesar (1931) not only launched Edward G. Robinson to stardom, it invented the American Gangster Film genre. It would be far from the last time that W.R. Burnett's writing would be used as a star vehicle. During the late Twenties, a 28 year old Burnett left a civil service job in his native Ohio to find his fortune in Chicago. At the time he had more than 100 unpublished short stories and novels, so he took a job as night clerk in a seedy hotel. Here he began associating with the prizefighters, hoods, hustlers and hobos who would populate Little Caesar. The film's success launched Burnett onto a successful screenwriting career. 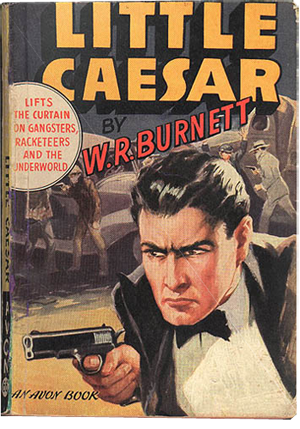 Burnett's work was thematically related to hard boiled writers like Dashiell Hammett, Cornell Woolrich and Raymond Chandler, but Burnett's characters recognize that they are being pulled down by the corruption of the city. They may long for a pastoral paradise, but they are too deeply entrenched in the urban ways to escape. In Burnett's world of twilight morality, virtue can come from gangsters and crooks just as evil can come from guardians and protectors. His characters are invariably human, which is often their undoing. This Gun For Hire (1942) is the story of a cold blooded hit man who is convinced to do the right thing for patriotism (and a dame, of course). He does do the right thing, but he does it his way. Wake Island (1943) claimed to be “From the records of the United States Marine Corps”, but it was in fact a highly fictionalized telling of the battle. More important than the history of the battle are the very American characters (again, fictional) who stood for their country just as the War was beginning. Action In The North Atlantic (1943), starring Humphrey Bogart and Raymond Massey, continues the theme of fictionalized War tales, this time telling the little known story of the Merchant Mariners who carried vital supplies to the fighters abroad. The film was nominated for the Academy Award for Best Writing. Nobody Lives Forever (1946) is a post War story of a conman who has gone to War and returns to the game. While setting up the big score, the grifter falls in love with the mark, which does not sit well with the rest of his gang. 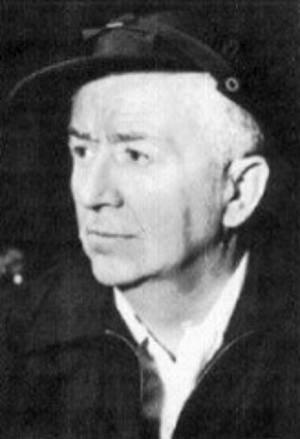 Over the years, Burnett worked with a Who's Who of Hollywood greats on both sides of the camera, including Raoul Walsh, John Huston, John Ford, Howard Hawks, Nicholas Ray, Douglas Sirk, and Michael Cimino, John Wayne (The Dark Command), Humphrey Bogart, Ida Lupino, Paul Muni, Frank Sinatra, Marilyn Monroe, Steve McQueen and Clint Eastwood. Be the first to comment on "WR Burnett"